Description: This Figure Eight Choker features a series of Figure Eight knots arranged vertically. By using two colors, the choker necklace appears to ripple. 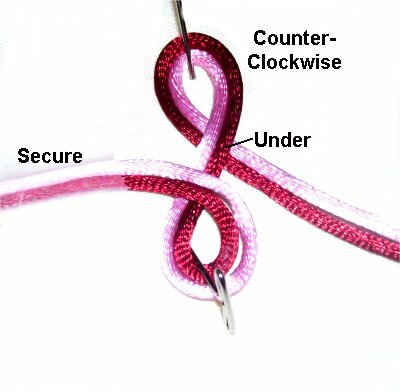 The clasp is a simple loop and button closure, which can be changed if you want a different type. You can add a button and/or pendant in the center of the design, or use small charms. 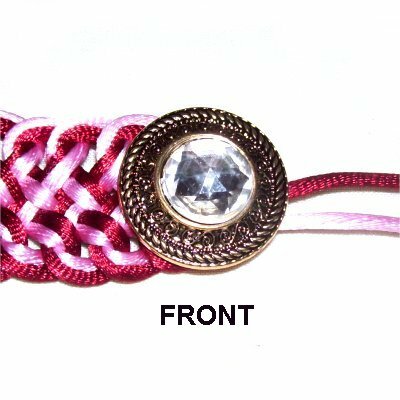 In the example shown, I used Satin material to make this Micro-Macrame design, and added both a button and a pendant in the center. Important: When using delicate materials like Satin, don't push pins through it. Instead, use the Cross Pin Technique or just LEAN the pins over the segment you are securing. This Macrame Necklace is easy to make, but is time consuming. You will need several hours to complete this necklace design. 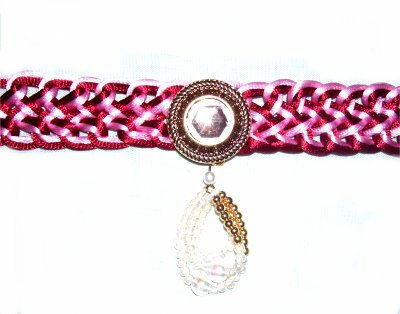 To view another similar project, see the Celtic Bracelet. 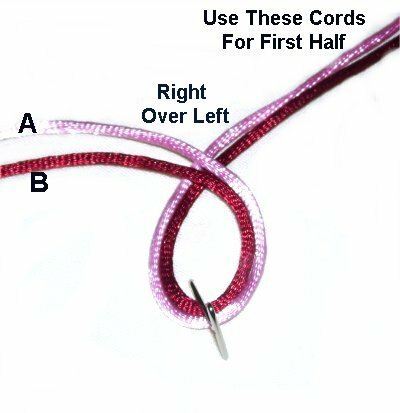 Cutting Instructions: Use the chart below to determine the length of the two cords for the Figure Eight Choker. For sizes over 20 inches, multiply your neck size by 10, and then divide by 36 to get the yards. 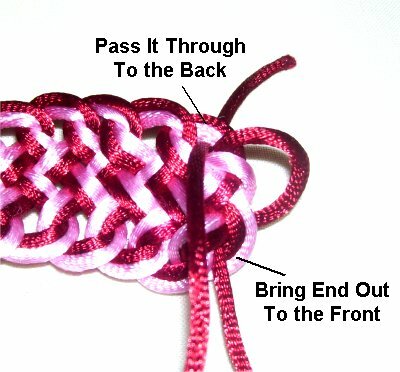 The instructions below are for the basic design used in the Figure Eight Choker, which is a vertical Figure 8 chain. Step 1: Make the first lower loop in the center of BOTH cords, crossing right over left. The cords to your right will be used to make the first half of the choker. Arrange the colors so that color B is on the inside for this first loop. Step 2: Move the cords upwards and rotate them counter-clockwise, to make the upper loop. Pass the ends under to make the crossing point, as you bring them back down. The loops should be around 1-inch in size. Design Tip: In the images, note how the colors have switched places at the top (Color B on the outside). The colors should change when you make each new loop. Check to make sure the cords are not crossed if you don't see this happening. Step 3: Make the next lower loop in a clockwise direction, passing the cords through the first lower loop from below. Bring the cords under the area in the middle of the knots, to make the crossing point. Using one cord at a time really helps -- see the next two images. I highly recommend you create the lower loops as shown below. 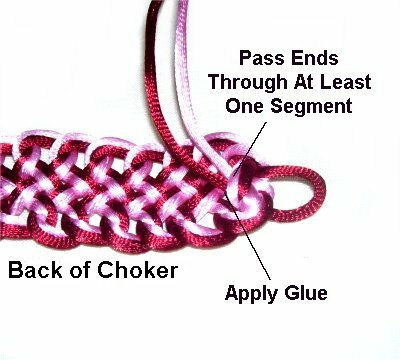 This allows you to hold the Figure Eight Choker while constructing it, which is easier than making it on a surface. When you create the upper loops, the colors are switched, so you use Color A first since it's on the inside. << Start with color B, since it is on the inside when you make the loops at the bottom. Step 4: To make the next upper loop, pass the cords through the first knot from below. Bring the cords under the area in the middle, rotating counter-clockwise. Tighten the first upper loop, which holds the second one in place. 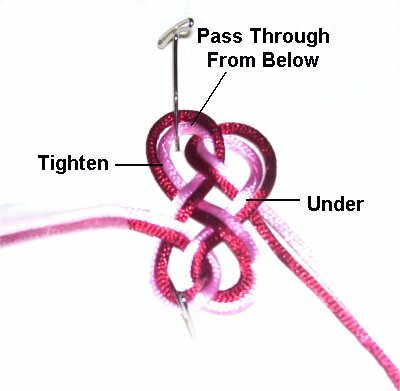 Tightening Process: The best way to adjust the size of the loops is to tighten them as you progress. They should all be tightened to the same size, which is why this project takes so long to complete. Always tighten the loop that the new one is linked to (on the left). You do this by pulling on the loop you made AFTER the one you are tightening. 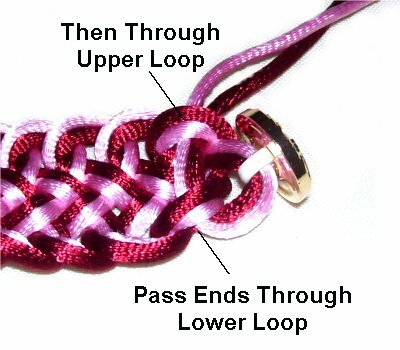 In the image above, I tightened the first upper loop by pulling on the second lower loop, which was made next. Step 5: Repeat steps 3 and 4 until the necklace design is the half the size you are making. So for a 16 inch necklace, stop at 8 inches. For these instructions to make sense, stop after you make a loop at the bottom. This end of the clasp for the Figure Eight Choker is a simple loop. You add a button on the other end. Skip the next 3 steps if you prefer a different type of clasp. 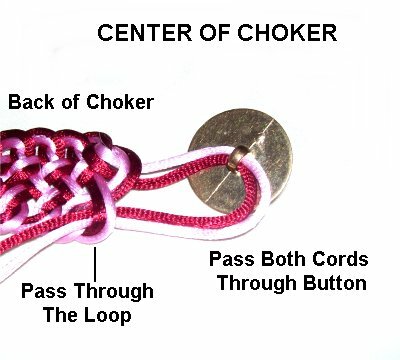 Step A: Make the loop for the clasp by passing the ends through the last upper loop you made, so they are in the back of the choker. Tighten one cord completely by pulling on the end. 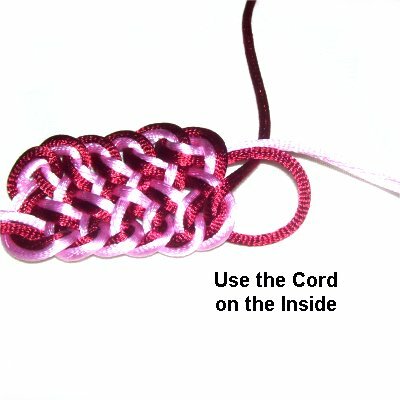 Leave a loop with the second cord. 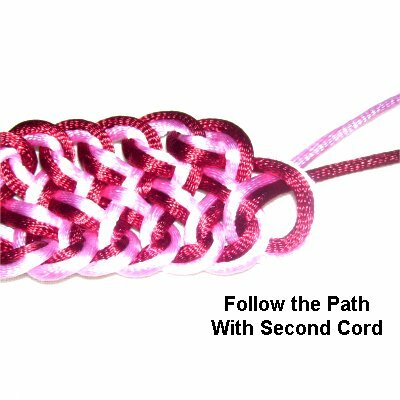 Step B: Bring the second cord to the front, by passing it through the last lower loop you tied. Bring it to the back again, through the upper loop. Step B, continued: Adjust the size of this new loop, so the button used for the clasp fits through it snugly. Don't make it too large, or the clasp will come untied too easily. Step C: Flip the Figure Eight Choker, so you are working in the back of it. Pass both ends through the back of one segment, to hold them in place. Apply glue under the two cords and use a clip to help hold them against the back of the choker. 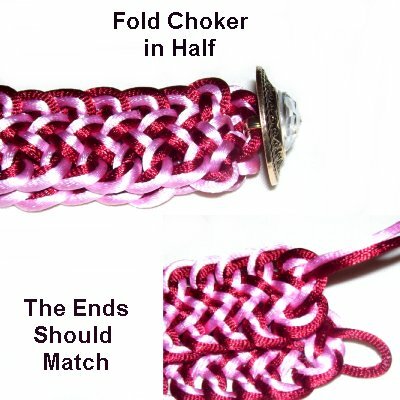 You can make the second half of the Figure Eight Choker moving left to right (same as the first half). That's how these instructions are written. You have the option of tying the knots right to left. 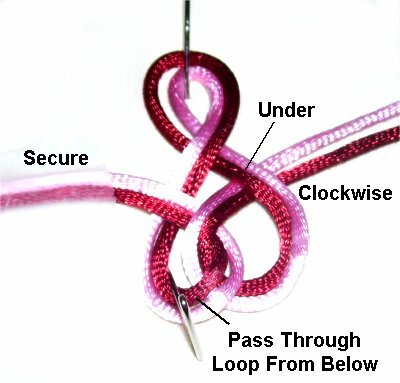 In that case, the loops are made in the opposite direction (clockwise at the top, and counter-clockwise on the bottom). You also need to decide whether to add a button to the center. Skip the next 2 steps if you don't want one. Charms and pendants are added after the necklace is completed. To continue working left to right, turn over the Figure Eight Necklace, so the back is face up. Position the center area on your left. Make sure the cords exit the upper loop. 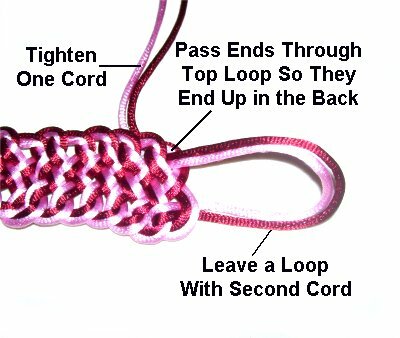 You can tie another loop if necessary. Make sure the button is upside down, so you see the shank, since you are working at the back. Pass the second half of both cords through the button, left to right. 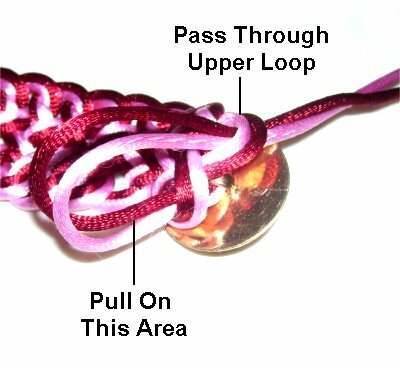 Pass them through the lower loop of the Figure Eight knot, and pull them toward you, so they come through front to back. Tighten the two loops next to the button by pulling on the ends in the area indicated. Tighten one loop at a time. << This is a closer view of how the back of the choker should look where the button is attached. Step 7: Continue on, tying more knots moving left to right. Keep the back facing upward while you work. Stop when the second half of the Figure Eight Choker is the same size as the first half. Step 8: You will complete the clasp by adding a small button. Skip the next steps if you decided to use a different type of closure. 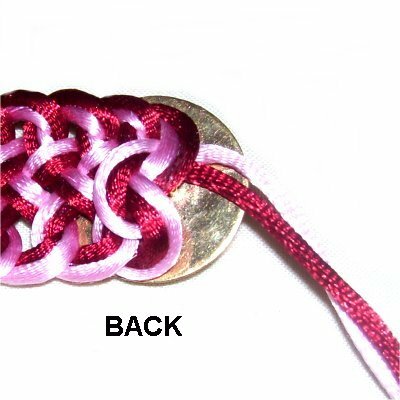 Fold the Figure Eight Choker in half, so the button in the center is vertical, and the ends match. Add extra knots if necessary, so both halves are equal. For a necklace with no button, just try it on to make sure it fits. Add the button for the clasp to both cords, then repeat steps 5A - 5B. Check to make sure the button fits through the loop at the other end, and that the ends are in the BACK when you are through. Step 9: Put the necklace around your neck to be sure it fits. Make any adjustments necessary. Cut off the excess material from both ends of the Figure Eight Choker. You can add a little more glue to the tips of the cords if necessary. When using Satin material, you can melt the ends with a flame to secure them. You can now add a pendant or charms to the area at the center (optional). Have any comments about the Figure Eight Choker? Contact Me.